After its first full calendar year of existence was dominated by ports, re-releases and remasters, ID@Xbox came into its own in 2015. Yes, as we looked back on this second full year of the program, the XBLA Fans staff agreed that ID@Xbox experienced a breakout. As always, there was no shortage of internal debate over the winners. However, the field of contenders was so strong in many categories that we could have selected one or two of the runners-up instead and felt great about it. Alas, only one game can win each category, and we love our final choices. We think you will too. If you don’t, tell us! The comments section is waiting below for your voice to be added to the conversation, or you can reach us on our Twitter or Twitch pages. Speaking of Twitch, this year was the first our streamers voted for the GOTY awards alongside our editorial and community management teams. This added more unique perspectives and gave us an excuse to include a bonus category for best AAA Xbox game, since we stream retail releases on Twitch in addition to our usual coverage areas of ID@Xbox and digital Xbox One games under $30 (including free-to-play). We still love our indie games, but all of us at XBLA Fans also enjoy a good blockbuster as much as the next gamer, and I’m personally very excited about our AAA winner, as it’s my overall favorite release of any scope on any platform in 2015. All right, no more fluff. Here are the big winners! John Laster, Editor-in-Chief: To be perfectly blunt, Spectra‘s gameplay is incredibly simple. Go right, go left, collect blocky gems and don’t crash into obstacles. While chasing high scores can add some level of depth, the game wouldn’t even be playable if the soundtrack wasn’t incredible. Thankfully, Chipzel, known for the Super Hexagon soundtrack, knocks it out of the park. With pure pulse-pounding euphoria, the soundtrack brings the other elements of the game to life creating a full package. The soundtrack for Spectra is single-handedly worth the price of entry and shines in an extremely competitive year for this category. Chipzel created the music using Game Boys to craft a high-energy chiptune score. Stylistically, the music shows a wide range from track to track, with each having a unique sound. It’s incredibly hard to pick a favorite track, but I highly suggest listening to Tokyo Skies, Only Human, Aurora Borealis and Veteran. The album is available for purchase here. Nick DePetris, Contributing Editor: It only took about 10 minutes of game time for me to be sure that Ori and the Blind Forest would be a strong contender for Best Visuals of 2015. The power of the prologue relies almost entirely on visual cues, including a stunning depiction of an incredible storm, a world transitioning from verdant greens to dying, dusty browns and characters developed with such a rich array of animations and emotions that no text is needed to give incredible impact to the heartbreaking end of the intro. Of course, there’s more to a game than just the beginning, and Ori impresses visually throughout. The meticulously crafted environments each have a different but visually stunning theme, perfectly complementing both the story and whatever new game mechanism is being introduced. The environments are alive with movement, both in the foreground and the background, giving the world more life than even AAA games are usually able to pull off. And the characters themselves, both friend and foe, have distinct designs and visual personalities that lend them depth as real members of this magical world. Ori and the Blind Forest is packed to the gills with the kind of visuals that immerse you into a game you never want to end. From start to finish, Ori is one of the most stunningly beautiful and well crafted worlds I have ever had the privileged of playing around in. Kevin Plumtree, Contributor: The Overlord series has always been well-regarded for its fun hack-and-slash role-playing gameplay, with a vast overworld to explore, quests to complete and light puzzles to be solved. The Overlord in those games earned his title, commanding a horde of minions with four subgroups possessing special abilities. Being the Overlord and using those minions for battle and puzzle solving was a necessity. With Overlord: Fellowship of Evil, Codemasters tried a slightly different approach, drawing more from a dungeon crawler background à la Diablo than from the past numbered games in the series. Unfortunately, this gameplay adjustment was not only unnecessary, but a detriment to the title. What could have been a fun budget game set in the Overlord universe instead is an easily forgettable disappointment; gone are the rich environments with fun destructible items, as well as the fun of controlling the minions, who have been relegated to being only of minor importance instead of one of the main draws of the game. It is a real shame that Overlord: Fellowship of Evil forsook what had made the series great and instead delivered mediocrity, especially when fans of the series were desperate for quality content. Overlord overpromised and underdelivered, but maybe that was part of its dastardly plan all along. Matthew Smail, Senior Staff Writer: I don’t think there has ever been a more fitting winner for this category than Quest of Dungeons. What I mean by that is that chances are you’ve probably never even heard of it. That’s a real shame, though, because Quest of Dungeons is actually rather good and definitely deserving of more than just a passing glance. Quest of Dungeons can easily be classified as a roguelike, but I see it as something more; it’s actually a superb hybrid of Gauntlet-style gameplay and the level structure and permadeath mechanic of games like Spelunky. A sprinkling of RPG elements add depth to what is often a very light genre, ensuring a game that is much more than the sum of its parts. Perhaps the only real downside to Quest of Dungeons and a key reason why you might have missed it, is the glaring omission of any multiplayer modes. This is the kind of game that would really benefit from at the very least some couch co-op, if not a comprehensive suite of online features. Personally I’m hoping for an expansion or an even more impressive sequel that completes the package in the next year or two. John Laster, Editor-in-Chief: A Crowd of Monsters released two games in 2015: Funk of Titans and Blues and Bullets. XBLA Fans’ own Michael Cheng called Funk of the Titans “pleasant enough,” but in the end it was a light-hearted running game full of attempts at comedy that couldn’t make it anything more than largely forgettable by the end of the year. Blues and Bullets was a complete 180 for the studio: a muzzle flash from the dark; a shot that hit its target in the chest. Blues and Bullets truly surprised us. It is gritty and violent. A film noir atmosphere that takes place in an alternate history timeline in the era of the Untouchables. The game is reminiscent visually of Sin City. Color punctuates the bleak black-and-white landscape. The game’s overall atmosphere, dialog, intricate crime scene investigations and solid action sequences with gunplay stand out uniquely in a genre almost solely dominated by Telltale Games. While we only have a single episode to base our opinion on at this time, Blues and Bullets puts a firm foundation down on which to build, and we can’t help but anticipate the rest of the season. While it wasn’t perfect, it was a welcome and surprising addition to the Xbox One marketplace. We highly recommend picking it up. Andrew Crews, Emeritus Community Manager: Smite is probably the most addictive game I have ever played. The fact that it is a MOBA and has had staying power on a console for the past six months is incredible. It’s breaking barriers that many other games have tried to break in the past and doing so with a very smart free-to-play model that keeps new content frequently surfacing, leaving players always striving to unlock the next cool thing. The true beauty of Smite is the multiple ways to play. It’s a MOBA that doesn’t necessarily intimidate players right out the gate, and you can credit that to players being slowly inserted into the competitive field at a pace that they choose to set. Smite accomplishes this “ease-in” environment with a semi-familiar third-person view, an in-game purchasing system that can be toggled to manual or automatic, and many game modes featuring a wide variety of gameplay styles that best suit the player. Smite allows each player to drill down into their own desired player experience while slowly gaining skill and knowledge about how to push their comfort zone a little further with each game. Many attempts at MOBA success on a console and many attempts at free-to-play on a console have failed in the past, but Smite seems to be comfortably accept its role as the exception to the rule for now. 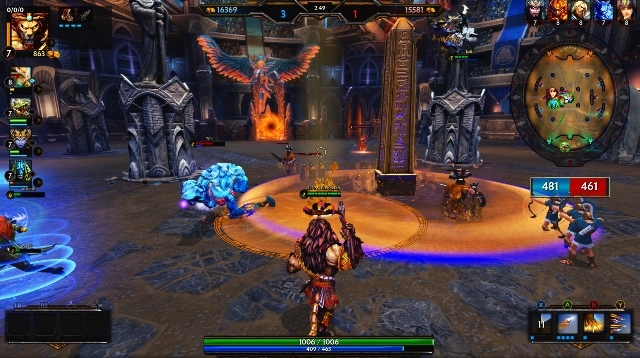 Given the amount of content the developers continue to release along with constant revisions to characters and gameplay improvements, Hi-Rez Studios’ Smite clearly stands out as the best multiplayer experience on Xbox One in 2015, and I think it’s safe to say it isn’t going anywhere but up in 2016. Christine Mitchell, Senior Contributor: In a year where many of the big AAA games went online only, Lovers in a Dangerous Spacetime bucked the trend with a focus on couch co-op only. The result paid off, with Lovers being one of the most unique, fun and challenging games you can play with a real life pal at your side. The beauty lies in the game’s simplicity as you and your BFF pilot a massive neon spaceship by manning turrets, lasers, shields and thruster controls as you traverse the galaxy rescuing adorable space-bunnies to restore all the love in the world. The controls are simple enough that anyone can play, but things can quickly turn chaotic as the game intensifies. Navigating through space vacuums whilst shooting bizarre armoured aliens can be tricky stuff! There’s also plenty of variety to keep things interesting, with randomized maps and spaceships that can be upgraded when players use special space-gems to provide different abilities to their loadout. Part of the fun is making a joint decision as to which combination of power, laser or metal gems works best in different circumstances. As the game progresses, you can also unlock new spaceships models that completely turn your strategies upside down. Literally. Jill Randolph, Contributor: In a year of huge AAA releases, I didn’t think entering 2015 that The Witcher 3 would end up being the best AAA game of the year. But CD Projekt Red’s effort stood out not as the best of 2015, but one of the best RPGs ever. Where The Witcher 3 really excelled was in its storyline. The love triangle between Geralt, Triss and Yennifer really brought you in and challenged you to decide what was more important to you in a relationship. Whichever woman you chose, you couldn’t help but feel a bit of sorrow for the one that was left behind. Geralt’s relationship with Ciri is also touching and shows that there is a softer side to the usually rough and tough Witcher. Another strong point of The Witcher 3 in comparison to other RPGs this year was its crafting system and map. A big complaint people have with RPGs is that their crafting systems are just too complex. The Witcher 3‘s crafting system wasn’t a piece of cake, but it also wasn’t so difficult that you needed a degree in physics to figure it out. The map was also a lot clearer than some other big RPGs released this year; it had a significant amount of detail with merchants, blacksmiths and other key points all clearly labeled and plenty of fast travel locations to help you get from place-to-place. Nathan Bowring, Senior Staff Writer: It doesn’t take long to realize Ori and the Blind Forest is something special. Just the first few minutes do so much to get the player invested in the world and its characters. It’s one powerful narrative, one that uses words sparingly as it delivers a complex, emotional tale that is simultaneously sorrowful and heartwarming. All the game does is wear its heart on its sleeve and hopes the player does the same. But Ori is so much more than its emotional backbone. This is one superbly crafted Metroidvania game taking place in a beautiful, seamless world. 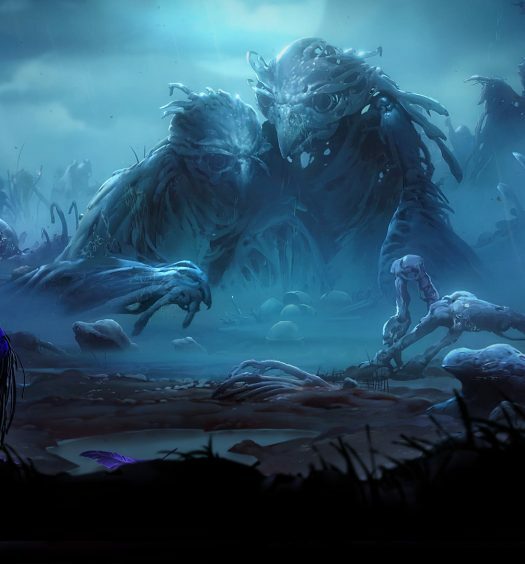 Playing as Ori is great fun because it pairs natural-feeling movement with flowing animation. The world is filled with interesting new abilities, each one a new toy you couldn’t imagine playing without after receiving it. Then there’s the difficulty, as the unforgiving world has no qualms delivering a quick death to the adorable protagonist. Challenges are around practically every corner, making sure players are constantly on their toes and honing their skills. Yet, no matter how hard things get, you feel encouraged to continue in ways that go beyond tough-but-fair design and instantaneous load times. You must persevere, because Ori must persevere. Emotional connection is the constant force pushing the game onward in both story and gameplay, making Ori and the Blind Forest one truly memorable experience.